During the Second World War J. W. Benson Ltd, official watchmakers to the Admiralty and the War Department, were installed in Woodhurst making instruments for aircraft, etc. Also around this time Woodhurst, in common with many large houses in the area, provided a base for members of the Canadian army. After the war, Woodhurst became the convalescent home for the South London Hospital for Women and the above multi-view postcard is the first of a series issued in about 1960. As the village Policeman in 1976 during the drought that year I recall being sent to Woodhurst to retrieve ammunition which had been exposed in the lake. This ammunition had been conveniently disposed of by the resident Canadians to speed up the de-mob. I lived here in a bungalow on the site from approximately 1963 to 1967; my Dad was the maintenance man. Our dog often swam in the lake and the woods were my playground. I had no idea about the ammunition! There was an asphalt tennis court with trees growing through and the kitchen gardens and greenhouse were still there, completely overgrown with grapevines growing round the greenhouse frames. I used to help Tom Bailey take in the patients' deckchairs every evening and ride on top of them on the sack barrow! My Dad's workrooms were in the basement of the main house. I think the matron was Sister Hutchins and she owned a corgi. My mother was in this hospital to convalesce in 1960 and I used to visit her from Streatham in South London. She could be the person in the Ward 3 bed second from the right but it is not clear. If the owner of the picture would send the picture to me by email I would be very grateful. Janet, click on Large Version for a better copy of the whole postcard, and again on the photograph to enlarge again. Select Open Document to see a close up of the lady second from right. Is she your mother? 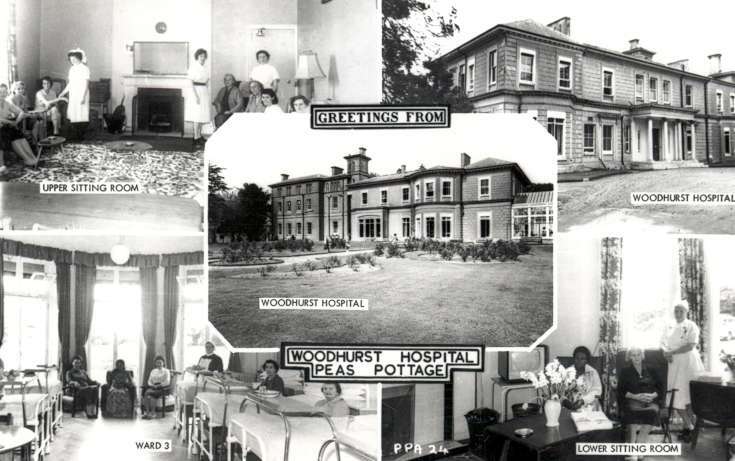 I have two postcards sent from Woodhurst patients around 1960. They are from Betty and Jessie, but I believe your mother was Constance Knott. It was a bit of a long shot! I shall forward scans to you by email. My mother, Vera Parsons, worked there in the war as a shorthand typist.